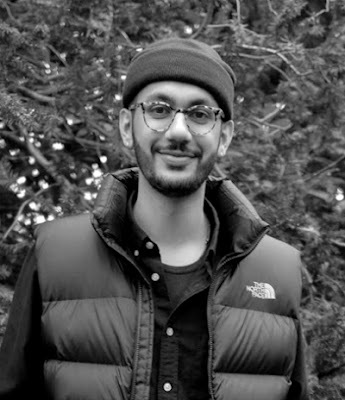 Juun J is one of those designers whose collections I really enjoy, however in practice the statement pieces tend to be a little too complex and polished for me to realistically incorporate into my wardrobe. A piece here or there could possibly work, but I suppose it is a case of certain garments looking better on other people than myself. 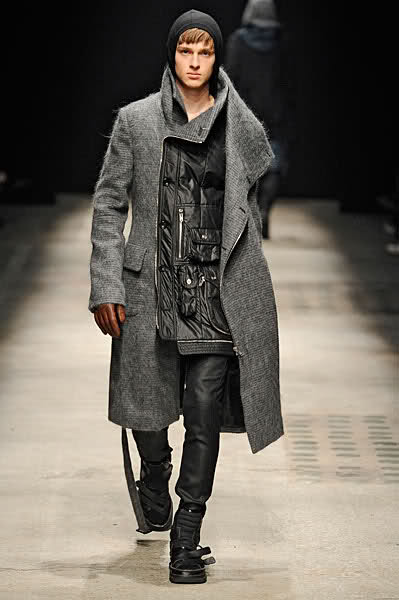 As such I had an odd relationship with his Autumn/Winter 2010 collection - I at once loved it, but I also knew that the majority of it was not quite right for me. It is a reaction I have with quite a number of designers to be honest, but then personal wearability is obviously not the benchmark for a good collection. 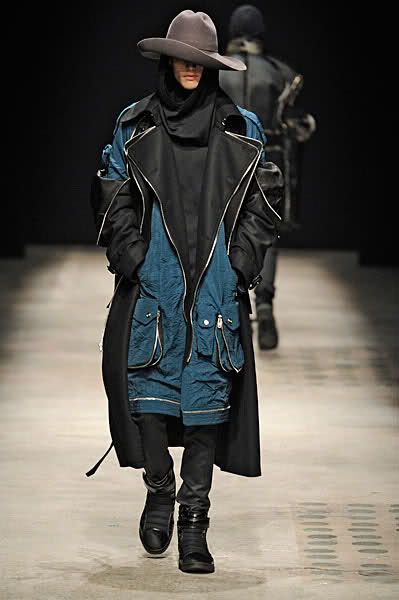 The designer that comes immediately to mind is Jun Takahashi of Undercover - amazing collections, but they just do not work on me. For me the process of building a wardrobe is about purchasing pieces you have that immediate reaction to, and then seeing if it works with your body/style/wardrobe/etc. Practicalities are important, but it is about that initial connection, and for me, although I liked the runway presentation and the styling, it was actually the more basic pieces from Juun that really attracted me. 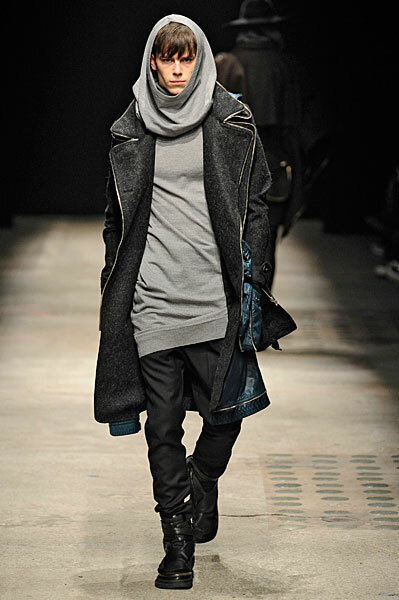 I was rather taken by the silhouettes, with the long line and oversize shape of the outerwear pieces and hoodies, combined with the streamline leggings and drop crotch trousers. 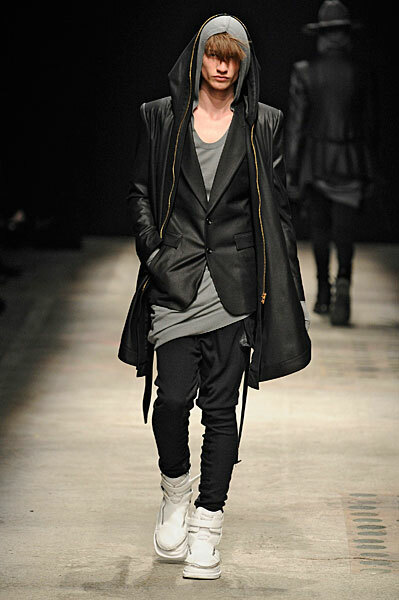 Of course the sharp tailoring thrown into the mix also helped to provide a nice set of contrasts. I realize the immediate reference one sees is to early to mid 00's Raf Simons, however Juun executed the idea in a far more formal and stylized manner - Raf was about subversion and youth culture, whereas these looks read as more refined and less raw. I think there is a comfort to be found in long sleeves and a long torso - it is all about the slouch. And indeed one also finds it with the trousers in this collection, which sit nicely alongside leggings - once again a choice of comfort. 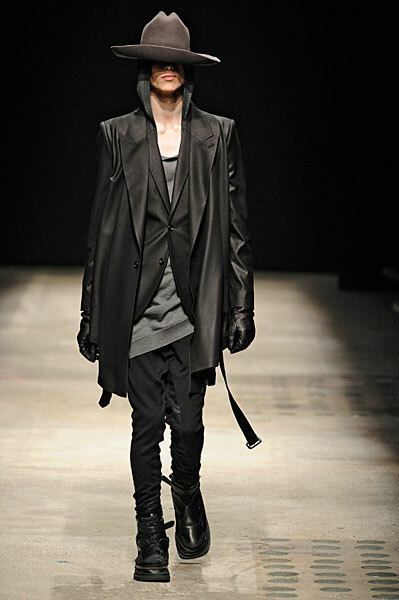 Juun produced a longer line, and a central point that was ostensibly shifted further down the outfit to the natural waist upon first viewing, although I would argue the central point in these looks is still the hollow immediately beneath the ribs - the spot Yohji Yamamoto argues is the best place for the top button of a blazer. I really do enjoy the longer line, although it does have to be approached with caution to avoid visually stunting your height. Indeed what particularly took my fancy were the long sweatshirts and hoodies, both featuring gloved cuffs. As someone who used to pull his school sweater down over his hands and poke thumb holes into them, it is quite a nice touch. It definitely has an urban feel to it. His clothes are AMAZINGGGG. They look like crap on the hanger, and when you pull it up to yourself, you think, "What..... is this?" But once you put them on, it's completely transformative. Most of the items can be interpreted as unisex, so girls shouldn't feel intimidated by the 'homme' label. 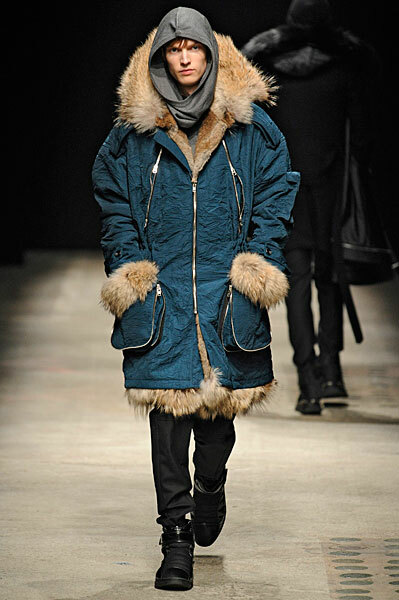 He also did a collab project with the Korean brand Bean Pole, where he designed a few backpacks and messengers. Totally droolworthy. I wanted to bring a few back, but there just wasn't enough room in my luggage. 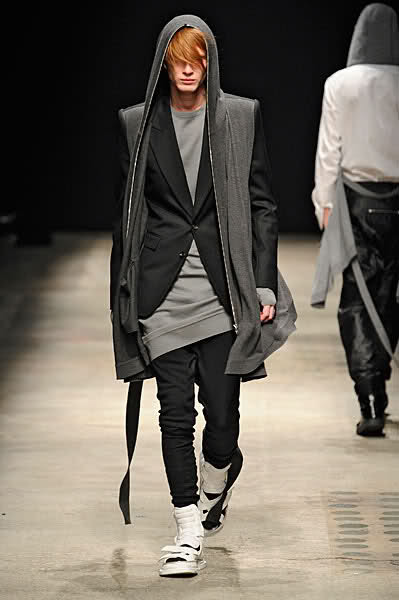 He's definitely one of the best out of the new wave of Korean designers. I so love your commentary on this. I learn so much! This is so great to see this collection. 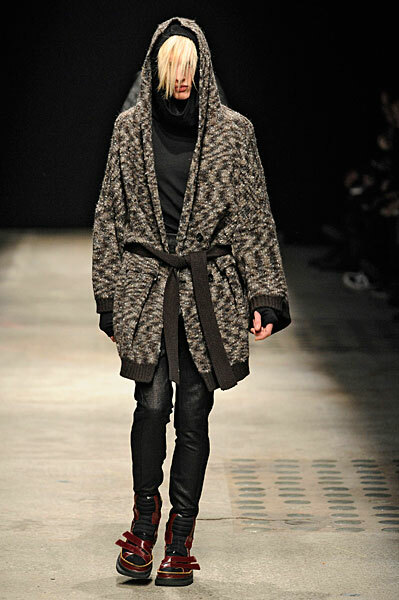 Thanks for this, I have such a soft spot for obscured faces and HATS on the runway. The "immediate reaction pieces" I call (to borrow from Tim Gunn) "Soul Stirrers." This reminds me in mood of what made me love Kris Van Assche in the 1st place was the mix of tailoring with sports/"street" wear. "As someone who used to pull his school sweater down over his hands and poke thumb holes into them..." hehe that made me smile. My very very old hoody now has thumb holes worn into them from constantly doing that. 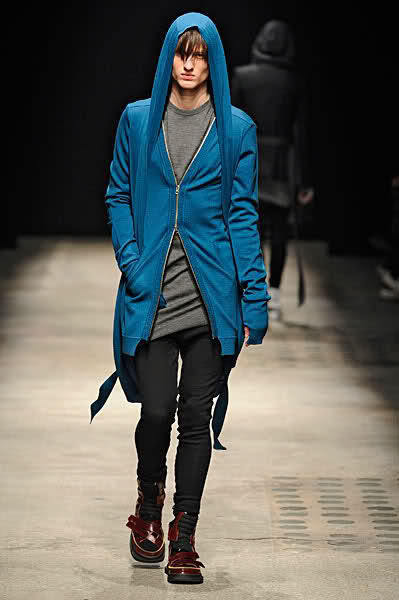 I love the proportions in this offering from Juun J, but I have to admit that I am not sure if everyone can pull of such looks (unless they are incredibly tall) and even still the styling is not the most flattering on body types that verge from the waif thin models in the show. I have been playing with lines in my looks...shorter and longer and have had fun with the plays on proportion. I love the fourth coat! All of these are gorgeous - I'm such a fan of the different lines and lengths, the combination works beautifully. 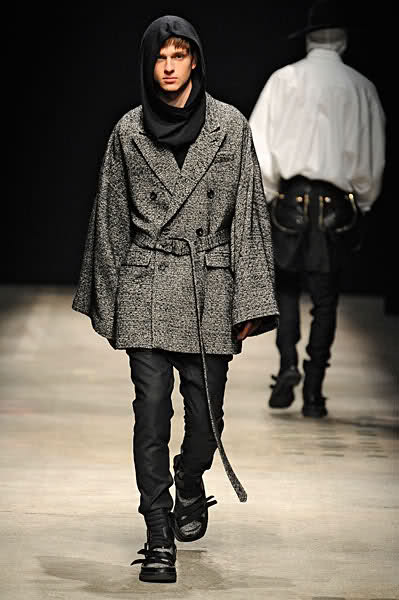 Your commentary is perfect, as always - and makes me feel like I understand male fashion a bit better!